On this day, no matter the unbidden ferocity of your stormy sea, there is a man who possesses stilling power. Winds obey Him. Seas obey Him. And because He is also God, with authority over all of creation, He is a man you can trust. You can actually know, and marvel at this: your trust will never be in vain. “Because of its geographical location, violent squalls frequently occur on the open water of the Sea of Galilee, especially in the period between May and October. Seasoned fishermen like Peter, Andrew, James, and John are certainly familiar with such storms, and so their fear, evident in Matthew 8:24–27, shows that the turbulence in which they find themselves is unusually fierce. 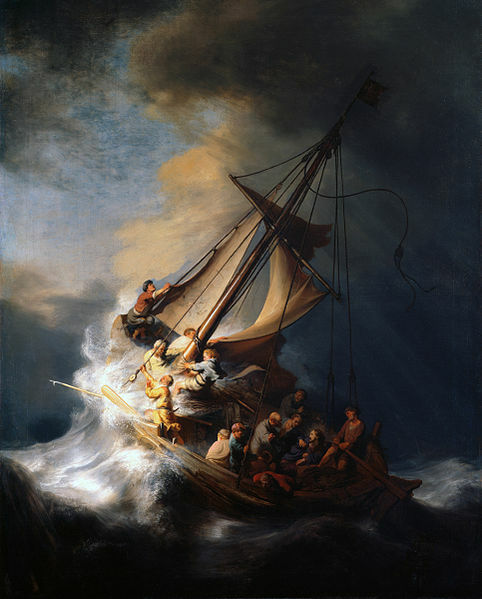 However, despite the storm’s ferocity, Jesus is able to sleep peacefully as the boat traverses the waves … Christ’s ability to sleep in the storm is more remarkable when we consider that the boat in which His company is traveling is the customary fishing boat of His day, just big enough to accommodate the small group of men and a large catch of fish. The sailors are completely exposed to the elements. Jesus is not worried like the others even though He feels the storm’s effects no less than they do. Yet Jesus’ command of the storm tells us about much more than His great faith. In the biblical worldview, the sea and the storm are associated with chaos and destruction (Ps. 69:1–2). Only God can control the sea, and in fact, He sets its boundary and stills its fury (Job 38:8–11). That Jesus is able to silence the storm and still the waves indicates that He possesses an authority equal to the Creator’s (Matt. 8:26–27). The disciples marvel at this miracle because it is evidence that their beloved rabbi is more than just a teacher; He is in fact God Almighty. This entry was posted in Christianity, Faith, God, Jesus and tagged Christ in the storm, Jesus calms the storm, John Chrysostom, Matthew 8:23-27, R.C. Sproul, Rembrandt, stormy sea. Bookmark the permalink.